In this vivid ethnography, Harri Englund investigates how ideas of freedom impede struggles against poverty and injustice in emerging democracies. 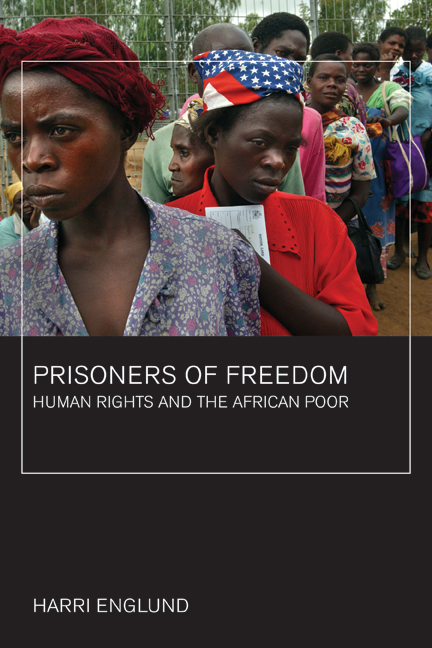 Reaching beyond a narrow focus on the national elite, Prisoners of Freedom shows how foreign aid and human rights activism hamper the pursuit of democratic citizenship in Africa. The book explores how activists’ aspirations of self-improvement, pursued under harsh economic conditions, find in the human rights discourse a new means to distinguish oneself from the poor masses. Among expatriates, the emphasis on abstract human rights avoids confrontations with the political and business elites. Drawing on long-term research among the Malawian poor, Englund brings to life the personal circumstances of Malawian human rights activists, their expatriate benefactors, and the urban and rural poor as he develops a fresh perspective on freedom—one that recognizes the significance of debt, obligation, and civil virtues. Harri Englund is University Lecturer in Social Anthropology at the University of Cambridge. He is the author of From War to Peace on the Mozambique-Malawi Borderland and the editor of A Democracy of Chameleons: Politics and Culture in the New Malawi and Rights and the Politics of Recognition in Africa.